February | 2014 | Whose Education Is It Anyway? “Please enter your professional email address” – a fair request? As mentioned previously, I attend a lot of free webinars, seminars, etc. My attendance of in-person events has dropped somewhat since my most recent change of jobs (almost two years ago now!) as it is not so easy for me to attend things in the centre of London. I always tried to take advantage of events ‘in town’, especially the multitude that happen around the academic hub that is Bloomsbury, all too aware that when the time comes for me to abandon London (hopefully career driven rather than meteorological) online events will be all that I have. I want to attend events for MY personal development, by registering with my personal email address the organizer has all they need to realize this fact. If they want to know who I am they can Google me still, or look me up on LinkedIn (which I know plenty have done). If it is an event to create sales or, at least, to encourage follow up sale calls then by not completing my organization you should see that this is PRIMARILY for my personal interest, this is not to say that I will not repay a good event (especially if it was free) with business in the future, this saves the organizers time by not having to do followup calls. There are a lot of unemployed people who would, no doubt, find webinars useful for keeping up-to-date whilst out of work. Certainly any charity or academic organization’s webinars, I feel, should not block these people, they may well be your future workforce. I appreciate some events (I’m thinking of those organized by JISC here) are for a particular community and are effectively prepaid for by those attending organizations via existing funding arrangements. However, as MOOCs have shown, there is value in opening events up to get input from others, one enlightening comment from ‘the outside’ might make the event useful for the majority. You can use polls in a webinar to learn more about me than what a registration form typically asks for, this can be used to tailor a session so it is of most use for the majority of the attendees. Overall, it seems to be a failure by some organizations to realise the importance in person-to-person relationships (and therefore sales) instead thinking about things from too much of a business-to-business/organization-to-organization viewpoint. Steam have just launched a beta option for ‘steam tags’ a way for their community (75m users) to apply bespoke categorization on titles in their vast store. Tags used regularly by users will find their way to becoming ‘Popular Tags’ that can be used by others to discover content via browse and new filtering options. This will all sound familiar to organizations and institutions who have opened up intranets, library/learning management systems and other platforms to such crowd sourcing methods. Indeed it is not dissimilar to the ‘categories’ approach of this and other WordPress sites. The FAQs resolve a number of the questions that always crop up with such approaches, such as “what about swear words?”, what about “different languages?” and if the content/game owner can alter the tags. In all three cases the answers are predictable; swear words will be filtered out (Steam having plenty of experience of hosting complex user discussion boards), you will see tags from users of the same language group as you and customers’ tags will appear no matter what the designer/publisher thinks. The latter is interesting in that it could show a disconnect and one might expect it opens up some publishers to looking elsewhere, for example, Ubisoft might find lots of “Excessive DRM” tags which they probably will not like and there is room for blatant hate campaigns. As for the language point, it seems a little disappointing that the expense has not been spared on some kind of automatic translation, yes it might not work well but, at least it would break down some of the cultural/geographic barriers. Overall, this is another community tool for a platform which, of course, has big plans. I love the tag idea, thinking about it from my education perspective, I wonder how many organizations would genuinely open their Learning Management Systems to such tagging? We’ve seen ratings (5-star) approaches for a while and so often see the extreme 1 or 5 star feedback scores, as tends to be the case in the Apple and Google stores too. This more qualitative approach could be a big help toward sorting through vast content as systems grow and discoverability does seem to be the driving force. As predicted, there was much interest in multi-device learning and this seemed to have replaced previous conversations, such as Apps versus HTML5 browser, etc. as mobile learning evolves. The challenge now seems to be to decide if you want a SaaS authoring tool (such as GoMo), a local desktop application or a hybrid model. The functionality gap between the SaaS and desktop is decreasing so the issue then becomes more about your workflows (for example if you want collaborative authoring etc). Cm-Group’s Luminosity is an interesting middle ground with the Studio tool offering rapid authoring and a cloud file storage allowing for collaborative authoring but with appropriate locking of files, etc. There was not too much in the way of new stalls, with the usual split between big systems doing multiple things (such as Cornerstone), smaller specific systems (such as SpiderGap in the 360 feedback space), eLearning providers and classroom/skills training providers. One new stall was KPMG Learning Academy’s showing the ability of big organizations to try and leverage their existing expertise into providing services in the space. Another area where there seemed to be an increase in stalls was with iTunes-esque aggregators for people to sell eLearning and other materials via single sources, such as opensesame.com. In a related space, I was slightly surprised to not see more of re-emergence for IT Training considering the implications of Windows 8, new versions of Office, etc. Asked what can learn from the consumer space. Social networks still growing and driving Internet use. Mobile access is the key tool that is facilitating this. Shows people want short, snappy, enagaging experiences [presenters at BETT having pointed out this is not necessarily a good thing for Brain training]. User generated content part of people’s persona and online personality whereas people are turned off by business systems as they don’t appear as relevant, easy-to-use, etc. Budgets help but big IT can go wrong – especially if designed around tech not user. Need to be more Netflix and less Healthcare.gov. Get better by developing a deep understanding of your audience. Should communicate purpose at every point, for example, Facebook does not offer you a blank space, it asks ‘whats on your mind’. Make users understand benefits, seek to innovate experiences around familiar conventions, spot engagement trends and always follow policy of continuous testing using real user input. Push your communication to users, do this by use of notifications, etc. with a call to act. It should not be about revisiting a website constantly, you don’t want to be ‘another place people have to visit. Take inspiration from emerging trends, for example, MindMeld helps engagement through suggested content. Can we learn from curation techniques of social media? They are designed around the moment, different to how it is used in workplace. Need clear objective, what should go in and out? What trying to achieve? Learning tech has been developing rapidly, for example Tin Can. People don’t tend to want to go to LMS, TC offer new approach via capturing informal – Tesselo built around this concept. Capture TC learning experiences via apps (for example scan book or QR code to record) and bookmarklet. Don’t have to be on website to capture learning. Then drive social through sharing and communication. Curator role is SME to pick best resources from social feeds to turn learning experience into resource. But what about motivation? Working in Open Badges (‘allow you to show off outside’) and reputation points for internal recognition. Encourage a circle of activity: collaborate, share, currate and motivation. Talking about PEN – partner development program. PEN online launched as social media via Tessello. Change management has recently become much bigger part of business. Interest in change management really came from VC project, treated as IT project but didn’t really work out. So wanted to improve this project – business requirements, vision, support, behaviours and success criteria. Key to success was clear business requirements before going out to vendor. Vision very succient and clear to what wanted to do. To overcome faculty resistance – gatecrashed faculty day, keep them in the platform, support the supporters step-by-step. Also need to train IT helpdesks, especially to avoid signin problems. Behaviours – know what you want them to do, role model behaviours for sharing, etc. In the end, users were ‘overengaged’! Actually succeeded criteria. Group of seniors so were allowed to go off and use it, good level of engagement but ultimately a small group and had support of faculty. Also did ensure people had agreed to social media guidelines before hand. eLearning authoring tool that has come out of Epic, spin out company but still default tool Epic use when building content for customers. Looks to have evolved nicely and worked smoother than when I have seen demos previously. Based around responsive content: auto scaling, auto ammend menus to page, etc. Need to think about layout design differently for multidevice. There approach is to think about column layouts. Cloud based SaS – no software for collaborative authoring, includes locking of content and content reviews for team-based authoring. Includes standard eLearning functionality like drag and drop activities. Can create corporate theme for colour schemes and branding, etc. However, showed how easy it can be to tweak fonts, colorpickers, etc. as needed. Multiview previews built in. Don’t have to deploy to devices for testing. All HTML5 but can also be packaged as native apps. Can choose between vertical and horizontal sliders/scroll for paging. If in phone can have horizontal scroll combine with down (“sensible scrolling” – set restriction on how long scroll will last to avoid ‘scroll of death’). Is your learning strategy aligned to your business needs? How learning impacts all your business? Learning worked throughout workflows? Business environment more complex than ever: Increased regulation, more global, doing more with less, war for talent so retention is key. What business critical issues related to learning? Need to identify, pull out and highlight. If fail can lead to business failures, bad PR, etc. Learning tech must do more than automate. Need just-in-time, real time collab with experts, targeted for career development, etc. Context key, like how Facebook (one of their clients) targets adverts and other material to you. Mobile isn’t future, its context. For example, pervasive learning including SumTotal learning embedded through Salesforce and retail platform. Key argument: context and pervasive. BYOD helps with pervasive, access learning from top of telegraph poll to a meeting room. Snippets of content, rather than length courses, help ‘integrated learning’ this is critical if it drives performance. Examples where this can work – quicker onboarding, link learning to development, learning to career plans, improve social/informal learning, succession based planning (identify risks of person losing and where training need would come), drive compensation incentives for learning (completed courses drive compensation), single record for all learners (one place for complete view, HR, payrol, learning, etc). Only about 30% of audience doing mobile learning when asked, presenter was surprised not more (Towards Maturity suggests has been bigger adoption in general). O2, had lot of old eLearning, looked to migrate. But BYOD so not onesize fits all. Flash to html5 wasn’t good enough as still inconsistent outputs. Instead building much more detailed specification to try and ensure consistency. Motivation to do it was that staff expected to be access things on mobile and expect it to work. Kaplan Financial Mobile app. Support 30,000 students – 67% said wanted material to be available, downloaded, on device. Students are presented with material related to course they’ve paid for. Included flash cards for learning reinforcement, key topic video clips and quiz practice. Have had 6500 downloads from 50 countries. Delivering eLearning via mobile or developing mobile learning (impact on content design)? Keep it simple (ensure cross device usability – inc swipe functionality over use of buttons). Design for multiple device (responsive). Mobile friendly media (video increasingly so but remember formats and file sizes). Think about what actually works for mobile. Aspects like shelf life and business case matter: don’t just shrink rethink; interactions need redesign? Do you need to rewrite the text? Content creation tools on mobile. Argued that generational changes are impacting how we need to use learning to retain younger staff (especially as LinkedIn has made it very easy to jump ship). An LMS used to work, but they do not work for our organizations or us now. We are all generation C(onnected). How move from top-down to Just-In-Time, but global, where everyone is different? Can we make sure there is no ‘skills gap’ anywhere, no matter what people doing or where on earth they are doing it? Yes, technology can help by coming in as social tool for a global audience. Move from being about learning management system to technology being the backbone of a learning organization. Argued most of us are generalists – less SMEs as can find what we need rather than being font of all knowledge on specific things. Prescribed/push content is valid but in learner-centric, learning organization, want them to absorb learning, i.e. be free to pull learning that is available. Forgetting curve shows classroom doesn’t work. Need to think longer term, learning as just part of work processes, seamless to working life. BUT admit this idea of learning organization is not easy to create. Argued against Tin Can as it is not important to track informal – allow people to be free and play. Focus should be on sewing together learning activities and work to form true blended learning. LMS has never been a place people live, they use different systems. So you need ‘invisible jacket’ of learning across workplace. Move from managing learning to delivering experience: learning experience system, a new approach they have built out in last year. BETT (British Ed Tech Tradeshow) was celebrating being 30 years young this year. It was, I think, my 5th BETT and the first where I did not spend much time in the exhibition, instead just having a quick walk round between Workplace Learning sessions. The Workplace Learning stream having debuted last year (https://whoseeducationisitanyway.me/2013/01/14/do-we-really-need-another-conference/). Overall it is a useful event, even with some cringworthy moments such as nearly everyone being introduced as “passionate”, one presenter being introduced as “my hero” and Ranulph Fiennes being described in the promotional literature as the “The World’s Greatest Living Explorer”, which might be news to some people at NASA. “The benefit of attending BETT in the past was to be more aware of the 5-18 (k-12) sector and learn lessons from it. Pushing people intro the three stands of compulsory, post-compulsory and corporate education will risk losing that cross-pollination”. I suspect that I am a prime example of this happening where I ‘switched off’ somewhat from the schools agenda and did not take away from BETT as much regarding school education as in previous years. The Workplace Learning sessions were interesting though, including catching up with what others are doing and what “modern L&D” looks like in companies such as Cisco, Barclays and BNY Mellon. A number of the sessions were ‘leadership’ focused and it was good to see a lot about trying to make people more reflective and recognition that, by being so, you can become more effective. The session from BrainWorkshops got me thinking about the neurological foundation of “learning” and was a nice follow on from the keynote last year by Susan Greenfield. There was a lot in this, and other sessions, about positivity and trying to do things you know are good for you, I am determined to try and take this on and have even started to use habitrpg to keep track of various personal goals. Charles Jennings, among other points, tackled the model of having L&D focused on role profiles, curricula, job groups, etc. as being out-dated. I disagreed with this somewhat; yes, we need people to realise the world is in flux and have skills to deal with that but Role Profiles etc. help provide some structure in an unstructured world. Therefore, I would argue, a well structured curriculum and role profiles can still be useful to help people benchmark themselves and be reflective against some vision of what good looks like in your organisation (although that should be benchmarked in some way to competitor intelligence). The information from Barclays on the advantages of apprenticeship hires over graduates was interesting. It ties in somewhat with my own view that we over sell how great the workplace will be to those going to university and as a result their experienced disillusionment in early career roles, which results in lost engagement and therefore attrition. Firms though also need to look at what they are offering, how many have cut perks such as lunches, bars, cake trolleys, etc in the last 20 years? Ultimately the apprentices may have brand loyalty for being taken on earlier but the difference between large numbers of applicants at the entry level vs. ‘War for Talent’ at the high end seems increasingly extreme. I found the Cisco ‘getting out of your comfort zone’ activity a bit cheesy and very corporate-L&Desque. Overall, I would rather see people look at reflectivity and self-awareness from the neurological and academic angles. Perhaps it is just me though and my belief that transparency (by blogging etc) is more useful than such workshop-driven activities? This transparency would create the kind of role models I would like to see in organizations and follow; perhaps here is an example of having a ‘leader preference’ rather than ‘learning preferences’. Indeed a lot of the talks stressed the importance of engagement and encouragement of lifelong learning as ‘what got you here won’t get you there’ and the need for managers to lead by example in this area. As for the exhibition, it was a case of picking up where things are continuing to evolve. For some organizations this is particularly interesting, for example, Promethean looking to become more than just IWBs with Classflow. 3D printing, meanwhile, is getting a lot of press but has been in the DT subject stalls at BETT for some time – it is really just the costs which are changing. Similarly, broadband price drops are increasing the potential for video and remote tutoring. Overall, there is a challenge of how best to support future generations and I did feel that, this year, there was a lack of real inspiration. Instead things continue to be disjointed with everyone from Michael Gove to Shakira having an involvement (alas the latter was not present, as far as I know). This was something of a follow-up to what I saw Myles talk about at LearningPool Live. Skills needed for eLearning going forward. The core point was that the idea of a ‘course’ sets up a challenge and one which L&D departments are slowly acknowledging when new web tools (such as Learnist) are making it easier for people to learn and that what it means to be ‘learning’ has changed. Many of the new tools do one thing very well; L&D departments have struggled to do many things supporting user expectations. Realistically need to find a balance of how to do things; courses do have advantages (for example, people know how SCORM works) but problems with discoverability when locked away in an LMS. He argued for a “clips over courses” approach with open, shorter, sharable solutions. The problem is accreditation and, therefore, there is value in the ways materials are packaged, including making use of ‘likes’ and ‘shares’ data for voting up material to identify what works and what is relevant. L&D staff need skill sets of ‘managing product sets’ rather than course production/commissioning. On the last two points it was not immediately clear to me how this differs from a well managed curriculum but I see his point that traditional L&D offerings can be disjointed and one-off, and this is what needs to end. Quite a lot of details here on what these three organizations are doing around leadership programs. Cisco has looked to move away from ‘courses’ to experiential learning opportunities. These have include drawing and dancing, the focus being not on the event but the ‘unpacking’ of the learning afterwards. This ties in with their key competencies, one of which is ‘disrupt’ (more on that CISCO competency model here). They are trying to be ‘realistic’ in that the employer-employee relationship you set out won’t be for everyone, gave an example of an employee who didn’t fit with leadership program/culture but founded what is now a successful company that partners with Cisco. The speaker from Barclays had a focus on early career and talked about how they have made use of school leavers and apprenticeships to increase diversity. Whilst programmes are accelerated, especially for non-graduates, they have increasingly allowed people to develop at their own pace. Interestingly, they are finding far lower attrition rates with apprenticeships than graduates, with graduates less loyal to the brand and more willing to jump ship for more money elsewhere. Therefore, they are reviewing the value in graduate recruitment, especially the sponsorship of students through their degree courses. Overall, they are aiming to be more patient with people and allow a balance of academic and vocational learning. Barclays have also used experiential learning to take people out of their comfort zone, arguing the first step toward good leadership is to understand yourself. Once this is clear people can align themselves to the brand and desired cultures. The NHS spokesperson had a slightly different angle and talked about their model as being one of, firstly, identifying what ‘good’ looks like and then encouraging role models in the organization to encourage other people to follow. Determining ‘good’ being tricky but all three panellists seemed to advocate a crowd sourced approach, involving audience, community, clients, etc. Part of her NHS team work on events which help break silos between professions and team groups, stressing to them the importance of self awareness and what impact people are trying to make. Leadership needs to be engaged and clearly supportive of what you are trying to do in future leader programs. Support line managers via resources on holding good development conversations, these are essential in creating role models and the correct culture. Technology can help with certain challenges. Tablets are enabling easier access to information in the NHS (although problems still exist, for example getting ward nurses access to a PC). Barclays are using social to break down barriers and now have cross-branch peer learning online. Cisco uses Webex for online communities of practice, including one around how to navigate leading a virtual team. Organization structures can make it difficult, for example the NHS would ideally have people move around to gain a variety of experience as they move up the organization. However, it is structured as a system with the different parts as different employers making such movement difficult. Measurement and ROI remains difficult but engagement and feedback are key, especially shifts over time. Lots of free material that can be used in leadership programs (TED talks, etc) a lot of it is about propagating a desire to continue development, make people realise need to grow their capabilities as ‘what got you here won’t get you there’. Programs need to be phrased in terms of client needs and not ‘L&D speak’. Leader program via the perspective of a participant (the editor-in-chief of Retail Week). They are ‘creating an environment where high performance is inevitable’ via personal resilience, increased self-awareness and a policy of ‘leader as communicator’. Self-awareness partly comes from feedback on performance/leadership from different bits of the business, at times this is uncomfortable but seen as needed and a relaxed culture enables trust throughout. Brand has been through a lot of change, argued possible thanks to his improvement as leader. Any advice for designing programs? Focus on the key objective: can you deliver business results. It is not about being a nice person. Rigorous selection process for program, top people from the group of companies, means there is value in learning and sharing from others, effectively the 20 or so people cohort should lead the organization in the years to come. However, people must seize opportunity and own their development, not about business doing it all for you. Keeping things simple and effective. Take a journey of self discovery. About ‘our responsibility to respond’, attitude is everything. See the glass half full. Need to be positive, being an optimist or negative may not impact outcome but will impact how you feel (this was illustrated via some stories around positive mental attitude). Take control of emotions, including Emotional Intelligence, via empathy and knowing what is appropriate. See change as being for the better – not ‘change is being done to me’. Deal with conflict, see that it can be responded to and everyone is different with different values. Turn problems into opportunities – ‘probletunities’ tackling them is exercise for the mind. Wellbeing and lifestyle – look after yourself to look after your body, less absenteeism. Make positive connections – don’t let mobile phone take over all kinds of conversation. Let go of the past and keep going – treat days as a restart and ignore baggage. Create an effective personal union – stories and experiences. Focus on highlights and successes. Argued that ‘stress’ has become a fashionable epidemic, people feel it is a sign they are not working hard enough if they do not act or say they are stressed. Companies need to give employees hope for the future, via a vision to enable people to bounce back and be resilient. Life will get harder, but we need to make choices and personal strategies to avoid negative implications. For example, she asked how many people in the room had tried (or regularly use) meditation for relaxation. One interesting point was the idea of ‘mirroring’, that has been proven to exist. This is where people copy others and therefore you should act how you would want people to act to you. The alternative, if you do not stay positive, is that you end up having ‘pity parties’. Overall points are sensible but, like common sense, it is not always that common. A case study of BNYM’s corporate university. Recognize learner experience bad, one LMS (SumTotal) but no consistency in how it has been used. Identified what had: around 250 L&D staff, employee needs analysis, existing content, etc. Improved the LMS through a new university portal, custom built with IT help in SharePoint (as it was already in place) as an overlay to the LMS catalogue. What does it mean? (learners can find the best thing for them and their personal development). As well as SharePoint, they are in the process of using IBM Connections and Microsoft Lync to improve the L&D offer. The structure of the university is topic-based ‘academies’. These are the core menu items in the SharePoint portal, with drop down menus of subtopics, which then go through to ‘resource’ lists (rather than ‘courses’). Academies don’t always line up with business units but they have ensured strong ownership of each (a ‘dean’ type role for each academy). They make use of most viewed and 5-star rating stats to sort SharePoint lists in a way to highlight the best content to staff. Collaboration around the content is done via SharePoint’s discussion boards. They encourage people to sync pages to Outlook, for example course calendars, so staff can see what is happening easily without having to regularly visit the portal. The resources include short training ‘snippets’ made via Lync, they are encouraging Webex for longer sessions due to scale issues in Lync. Challenges have included that staff expect levels of accreditation and external reward since the ‘university’ title was adopted. In addition, they still block YouTube which has made adoption of ‘resources’ model difficult. Argued that anything can be explained in an effective way via visuals when you tell a story, so you can inspire staff faster. Tips for how to do this from the “The Diagrams Book: 50 Ways to Solve Any Problem Visually” and workshop were considered including the need to keep your potential audience in mind as diagrams can be viewed/comprehended in different ways. Lots of examples were quickly run through, for example, to demonstrate a strategy: do as a market map with two most important variables on x and y-axis and plot your direction of travel toward the upper right. Argued that always tied in with the questions you are asking and the story being told, for example, if you are running a project “how brave do you want to be?” You can then make diagrams based on the answers to illustrate purchase/adoption, project plans, etc. All the examples shown were very clear, the argument being that we overcomplicate things such as organization charts, an example of diagrams that should not allow for any ‘wiggle room’. In relation to the faster inspiration of staff, some general tips were given for how best to hold conversations around the diagrams. One example being that, if you start a conversation with ‘If’ at the start, you immediately frame it to include a condition around time, cost and quality. Similarly, always talk about how ‘we’ can solve ‘it’ when there are interpersonal problems. Negotiations can be considered in terms of ‘must, intend, wish’. Other useful examples included how to illustrate a point trying to be made, for example, illustrate changing role of team leader as 4 sections of a circle: directing, coaching, supporting and reinvigorating. Argued a lot of the models you remember are due to the diagrams, for example the Cone of Experience. Covered what they (the Global Sales and Account Management Academy) have done in the last 3 years to engage and motivate their staff into self learners. Drivers for change included the recession but also acknowledgment that the existing learning offer was disorganized around their go to market approach(es). measure roles supporting the business goals; redefine what the business delivers to sales (tailor learning to their role in sale process). Overall message was to advocate for alignment with business and prioritize everything back to business (especially important with today’s, post-recession, decreased resources world). Argued that the learning delivery infrastructure is key. Infrastructure in this context was described as “getting right stuff to right people at right time”. Therefore, needs analysis remains very important (including identifying what requires training and what is just a communication issue). Suggested that you can’t just push learning, there needs to be a pull from context, including tools learners are already using. To be success needs to be part of everyday workflow, for example embed in Salesforce. Need to connect learning events all the way through with follow up, JIT support when using the learning they did, etc. Need to empower managers; they are ones who have to enable learning in the field. A lot has been spent on manager training as CEO realised this is essential. support throughout to enable people to fulfil their roles. ‘Chat’ in social part of Salesforce. Are just rolling out Intuition for some JIT information for pre-meetings, etc. Started by stressing how odd it seems that brain training is still something which is inaccessible to many people, especially as understanding how your brain works and how you learn enables you to do more. Stressed that the brain is not static, rather success is about keeping it healthy via challenges. These need to challenge your “brain at work” and “creative brain” as they are different – we should aim to master both. Problems include that we are losing long term focus by giving our memory rewards via short bursts of doing something different (this is tied in with the habit of checking your phone constantly, etc). Experience (embrace the unfamiliar, triggers keep brain plastic – even just walking a different route than normal helps). Score yourself out of 10 for each point of SENSE and aim for an improvement each week. Your Brain at Work – plan tasks to when you are most productive, don’t multitask, don’t start your day with email, avoid brain heavy work mid-afternoon (when your body would like a nap). Creative Brain is roughly back part of brain – doesn’t work in same way (‘aha’ moments can be explained neurologically, inc. subconscious), i.e. this is the seat of innovation – to be creative organization need to think about brain. Mention for ‘Getting things done’ book – deciding what to do is deciding what NOT to do. Brainworkshops.co.uk – all about being effective. A taste of the experiential learning RedHat have run with Cisco (mentioned in the day 1 panel). Based on idea that we like to ‘known’ but really life is faster paced and more unknown. What we need to prepare people for are Volatility, Uncertainty, Complexity and Ambiguity in their lives (VUCA). One area of focus in Cisco was ‘whole person intelligence’; data and statistics are great but leaders need to not forget intuition as move up organizational levels. Ran through an example where everyone in the room was given a piece of string, the logic seemed to be to make you think about your whole body. Are your hands doing something themselves with the string or do you think about what you are doing? They then asked us to ‘have a string conversation’ with others in the room, to make you think about your ‘default’ behaviour and how you react to people you don’t know. A couple of Cisco employees who had been through the program were present and one described the outcomes as being that they had ‘connected whole of myself’ to help others. Relationships are a necessity, the training helps you realise “why do I hold my string back?” The aim is to move people towards being more positive, considering brain science and emotional intelligence. Another big issue they are tackling is a global view for leaders. As with many organizations, they want people who can see wider picture, not just about moving up and down through levels. Newer bit of training is ‘the relationship system(s)’, if you get that then you can perform much better (i.e. have a networked relationship not about your relationship with specific individuals). Argued that you are a ‘conscious leader’ if you are a systems leader, easier to relate to system than every individual. Don’t think about individuals, for example when building project teams think about skills of the system and your personal intelligence to bring best out of the group. Individuals within network take more responsibility and hold relationship with team. Talent retention can be from bonding in the teams within the network. The sensei of 70/20/10 took the opportunity to stress that it is not a case of either/or and that he is not against ‘traditional’ classroom learning. He did, however, argue it is better to call formal/informal “directed” or “self-directed” as you cannot formalize the informal and, if you try, you risk losing the importance. So what do we really need? Incorporation of informal/self-directed learning into the DNA of your organization. Tin Can activity data will give some insights but certainly not holy grail to solving this. So how can we support the 90ish% and encourage a greater workplace culture of change? Argued that curricula, learning paths and role profiles are old fashioned, they do not represent fluidity of workplace. Reminded that 70/20/10 is just a framework, about outputs not the numbers. Cisco don’t use the numbers, instead use experience/exposure/education. Adults develop through four things: experiences, practice, conversations & networks and reflection. Showed some examples on slides of how this can be encouraged/supported – similar to from around slide 26 of this deck: http://www.slideshare.net/charlesjennings/the-702010-framework. One idea I really liked was that we should encourage others to ‘narrate your work’ (going back to the leadership through transparency I mention above). thousands of hours of independent experience and reflections. Based on above list, encouraging internal sharing of how high performers do things is often the best way for people to learn. ‘Learning in the workflow is powerful’ – most powerful when integrated in what people do. Includes, social as part of informal that shows big impact. Backed up with idea of “what got us here, won’t get us there” with stats from corporate leadership council. How to adopt 70/20/10? Answer is that there are different models. Argued for a ‘revolutionary implementation’ which is critical, embedding and extracting learning from work. A 10 point implementation model is available from the 702010 Forum website. Benefits from adoption include a high performance culture, increased engagement and other aspects. Cultural challenges can come from organization, one thing do need is ownership from top (a Governance Council can be a way to drive change if majority membership is senior execs). This was the one session I attended in the main event away from the Workplace Learning stream. To be honest, it was very disappointing. David Puttnam talked about he facilitates university classes from his home, as well as making use of video clips. There was a long example given related to classes based around his most famous work (Chariots of Fire – http://www.youtube.com/watch?v=L-7Vu7cqB20). One interesting point was his argument that creativity is a muscle that can be trained/exercised – focus, resilience, collaboration, tenacity and imagination. Then there was a bit on how broadband is enabling change, including video conferencing and that schools need to lean on their providers if not getting a good enough service. There was then effectively an extended advert for the Janet VC system. As one presenter put it, this is “unique in the world but still a secret to many”, this always bamboozles me as JISC/JANET and other central resources are the real advantages the state system has over private providers. I would also agree with the point that schools are missing a trick if they do not introduce it as skills of working remotely are important for future workplace skills. AVer ClassHD got a name drop for new ‘cheap’ hardware. The Janet service also has ‘content providers’ ranging from NASA to one of Nelson Mandela’s bodyguards (who was present and spoke). The argument being that it is an efficient way to bring industry and experts into schools across various subjects. Also good for the companies as easier to get to multiple children/students via educational outreach programs with less need for Health and Safety, travel costs, etc. Virtual University had a short spot to explain their focused worked which is primarily with 16-18 year olds, introducing them to remote working with corporate and university partners. VU were new to me. Tablets, tablets, tablets – to walk around BETT you would be close to thinking the PC is dead. Even the big Windows OEMs were tablet heavy. A lot of the other suppliers have clearly shifted in the last couple of years to tablet docking stations, tablet security, device management (which was notable last year with the likes of http://www.jamfsoftware.com/), enhanced wifi (including lots of resellers of http://www.ruckuswireless.com/), tables and desks designed with tablets in mind, apps, etc. etc. http://appshed.com/ – example of easy app authoring. http://www.educationalappstore.com/ bridging way to get people the correct apps. Some new tech, not least plenty of 3D printer stuff, such as http://store.makerbot.com/3d-printers. Continuing increase in videoconference and video recordings, across all age groups. http://www.clickview.co.uk/corporate an example that offers education and corporate solutions. On-going divide between specialist tools, aiming to do a few things well, and all-in-one type providers such as http://www.eschools.co.uk/ and also ‘simplified’ options based around Google Apps such as http://www.realsmart.co.uk/. In the Workplace Learning space, I got talking to the founder of Co.Creator that sounded like a very interesting supplier of leadership/innovation program. Insight IQ = Information Skills? Following on from my post where I wondered if the idea of ‘information professionals’ is now defunct, I recently came across the CEB’s ‘Insight IQ’ [IIQ] model. From my information/education/L&D perspective, I find this a very interesting concept. 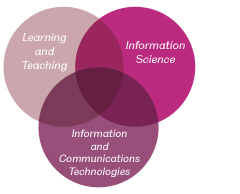 It is largely about information skills (search, retrieval, etc.) and literacies (analysis, evaluation, etc.). The ‘insight deficit’ is in many ways what information professions have highlighted for a long time, knowledge systems may be in place but skills are lacking. The CEB materials seem to make the point that the focus now on Data Analytics is effectively the spark to shift attention to this. Information Attainability and Usefulness would then be more likely the systems/tools of your organisation, combined with strength of a personal (learning) network and search/retrieval skills. Listens to others and is comfortable with dissent. According to the theory this is 38% of employees. There is no doubt some ubermodel that could be pulled together here…something to keep thinking about.